Wall samples, measuring eight feet square with a variety of window buck assemblies, await testing. 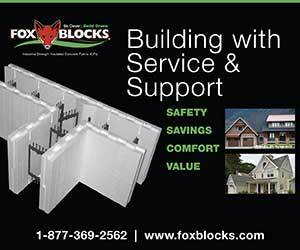 What’s the best way to install a window buck in an ICF wall? 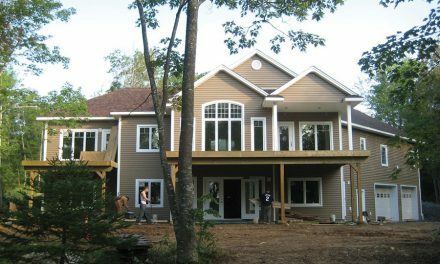 Ask a dozen contractors, and you’ll likely get a dozen answers, depending on their preferred buck system, ICF brand, and regional climate. This lack of consensus regarding best practices has sometimes hampered industry growth, but this challenge is nearly a thing of the past. 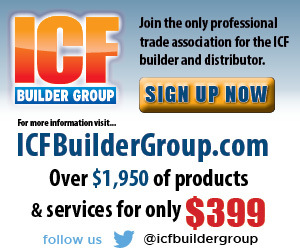 The leading ICF manufacturers have teamed up to develop generic installation details and code language, and best practice guidelines. 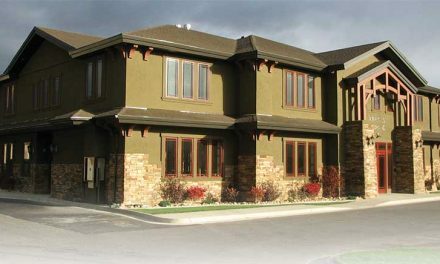 This will greatly simplify the work of architects and building officials, as well as help convince skeptics that ICF technology is a proven, accepted, and viable construction method. This long-term effort will also benefit the contractor, who can assure the customer that the project is being built to the highest, industry-approved standards. This effort began about four years ago, when the leading ICF brands teamed up with the British Columbia Ready Mix Concrete Association (BCRMCA) to test various assemblies. By consensus, they determined the item of greatest interest was to investigate the performance of the various ICF window buck systems regarding air and moisture infiltration. 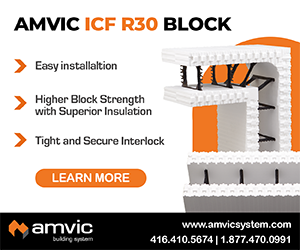 So, the BCRMCA coordinated a series of meetings with the technical representatives from most of the leading ICF brands: Amvic, Fox Blocks, Logix, Nudura, Plasti-Fab (Advantage), Quad-Lock, and Superform. Arxx and Reward were also involved prior to their acquisition by Fox Blocks. The Home Owner Protection Office’s Technical Research and Education Branch, a division of BC Housing, also took an active role. Window assemblies were tested for moisture and air infiltration with extreme pressure. The results will be published later this year, along with recommendations and generic details. With that information, Phase 1 testing began in 2012. 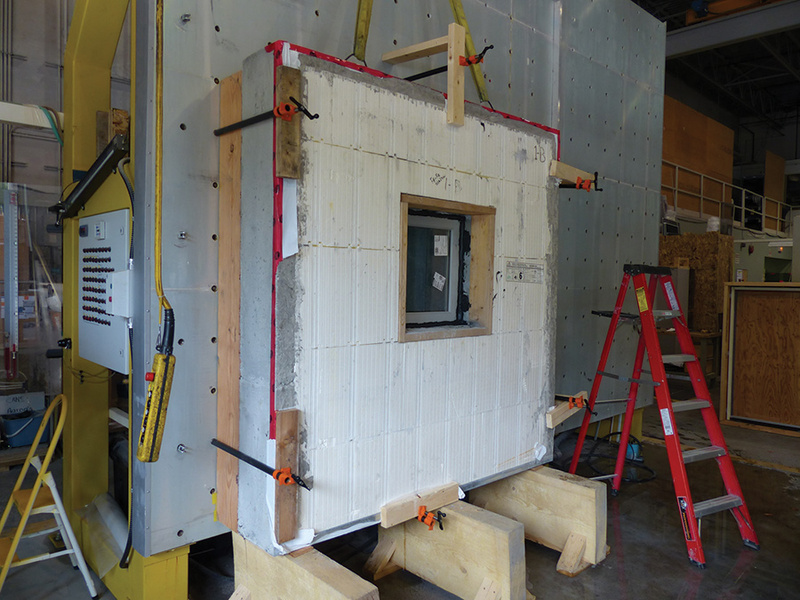 They built and tested six prototype wall panels consisting of ICF concrete walls with different combinations of moisture barriers, bucks, and window installation details. 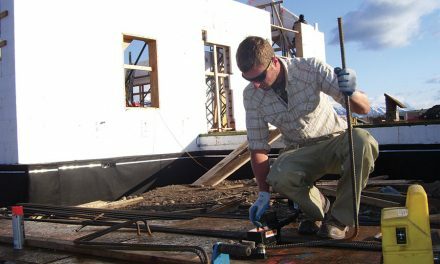 Cascadia Windows, which provided the workspace to construct the panels, also donated and installed the high performance windows for the test samples. The same windows were used in all tests for control. 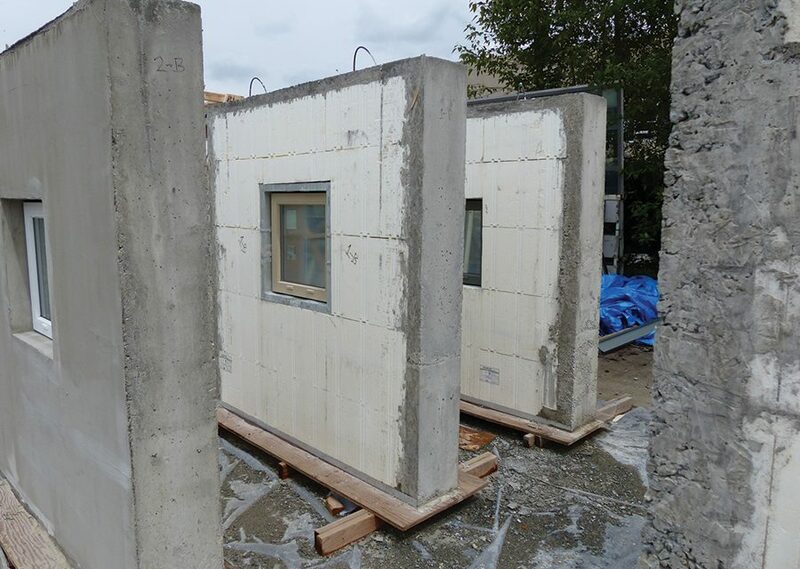 The eight-by-eight wall panels were tested using industry standard air and water infiltration tests (ASTM E283 and ASTM E331, respectively) and measured for air leakage and moisture intrusion during simulated once-in-ten-year rain and wind events. “What we discovered,” says Hubbs, “was that the window-to-wall interface was quite leaky.” The amount of air getting through was of concern, but the amount of moisture was even more troublesome. “In Phase 1, we found that some commonly used installation methods have lower than expected performance levels,” he says. Vinyl bucks were particularly leaky, since the field-assembled corners aren’t heat welded. However, one significant finding in Phase 1 testing was that all ICF cores exhibited a very high resistance to both air and water infiltration. “We found that the concrete core was very watertight, and if we could tie the window back into that, it would be much improved,” he says. With that knowledge, they moved onto Phase 2, building another six wall panels and testing the assemblies that performed best in the first round, including internal and external wood bucks. They added the all-EPS Gorilla Buck, an EIFS basecoat system, and a removable buck that left the window attached directly to the concrete. Systems were tested without cladding, so the actual strength of the finished assembly is likely even better than what test results indicate. “In Phase 2 we… exceeded the building code minimum with all of our samples,” says Hubbs. 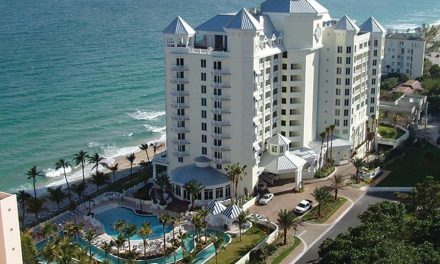 “We obtained performance levels normally seen only on high-rise cladding and glazing systems.” Several assemblies withstood pressure of 700 pascals (Pa)—equivalent to a hurricane-force storm—and the direct-to-concrete sample was still tight when testing maxed out at an incredible 5,000 Pa.
Hubbs says, “What we discovered is that some methods being used in the field are problematic, but the good methods are fantastic… These results are very encouraging and provide several moisture management strategies.” Pending a formal best practices guide, the interim guideline is to remember that the watertight plane in an ICF wall is the outside face of the concrete core, and for best moisture resistance, the windows should be tied into that with critical barriers. With lab testing complete, the next stage is to test entire full-scale wall assemblies in the field, instead of eight-by-eight samples in the lab, to verify that actual performance matches lab results. Once the field trials are done, the group will develop best practice details, accepted assemblies, and accepted details, all drawn for a generic ICF wall. Hubbs notes that his company can develop proprietary details for any buck or form brand, if they’re willing to cover the cost. The official report of this testing, running about 80 pages, is being prepared for publication by the Home Owner Protection Office/ BC Housing, and should be available in mid-May. Kelly, at BCRMCA, says, ” The results of this testing program will form the basis for an ICF best practice guide and the creation of industry standard details and installation practices.” He notes that the lab report and guidelines will be applicable anywhere, not just British Columbia, and that this is just the first step in a long-term program of developing generic details for ICF.